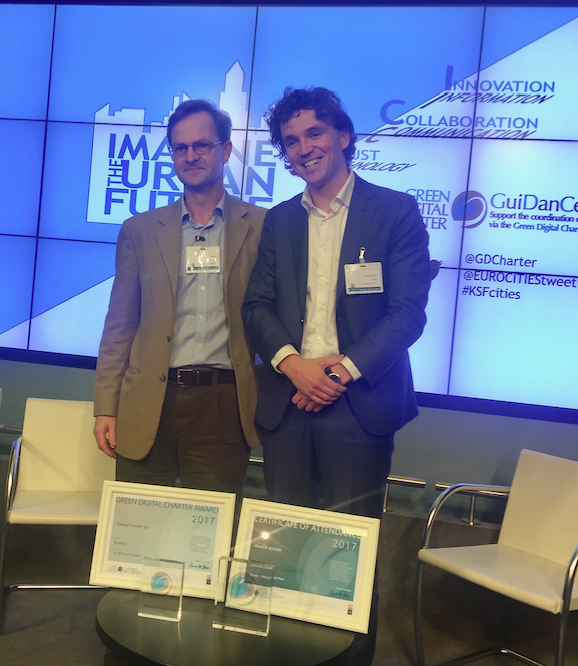 The Amsterdam Virtual Power Plant, in which some 50 households jointly trade the energy from their home batteries, was awarded the Green Digital Charter Award 2017 by Eurocities during the ‘Imagine the Urban Future: Innovation Collaboration and Trust’ conference in Brussels on 23 January. Since the summer of 2017, the solar energy that is not used immediately, is stored in a battery at home. This energy can be used at another time, or can be traded if the energy price is high. Conversely, energy can also be purchased and stored if the price is low. Finally, the batteries can be used to balance the local electricity grid. The Virtual Power Plant is part of the City-zen project and is initiated by Alliander, EXE and Greenspread. In addition to Amsterdam, the Replicate from Bristol and iSCAPE projects from Dublin were also nominated. In Bristol, peak energy consumption is reduced by equipping 150 houses with an energy management system and smart household appliances. In Dublin the city is landscaped green, sensors are installed and citizens are stimulated to change their behaviour to decrease local air pollution in a smart way. What is the Green Digital Charter? The Green Digital Charter was launched in 2009 by Eurocities in collaboration with Manchester and Clicks & Links. The Charter is supported by the European Commission and signed by 50 cities from 21 European countries, including Amsterdam. These cities indicate that they want to achieve the EU climate goals with innovative digital solutions. The cities share best practices and results with each other, build local partnerships and ensure that digital innovation becomes part of urban policy. Above all, every city aims to start 5 large-scale and replicable ICT projects within 5 years of signing and reduce the Carbon Footprint of the urban ICT sector by 30%. What has happened in Amsterdam so far? One of the large-scale initiatives launched in Amsterdam is City-zen, a European-funded project in which 25 partners find out in practice how the cities of Amsterdam and Grenoble can drastically reduce the use of fossil energy in the built environment. In addition to the Virtual Power Plant, homes are being renovated to reduce its’ energy use, cold is being extracted from a drinking water pipeline and river cruise ships are supplied with local green energy. Digital innovation is a focal point of the municipality and many other parties in Amsterdam and one of the reasons why Amsterdam was named iCapital of Europe in 2016-2017. The municipality has now started a CTO office, to get technology in the capillaries of its own organization. The cooperation of parties in Amsterdam Smart City focuses on realizing concrete innovations in the city. In Green IT people work on innovations to make the ICT sector more sustainable.This knowledge is shared with other cities through various Eurocities meetings around this theme. Amsterdam also participates in the smart city technical experts group. Reducing the emissions of the ICT sector in Amsterdam is not yet a fait accompli. The capacity of the Amsterdam data centers grew by 30% last year, and is now the second hub in Europe. A covenant was signed in 2013 to reduce 15% energy consumption. In 2016, Amsterdam was runner up for the Green Digital Charters Award, then with the project Open Data – Smart Neighbourhoods.